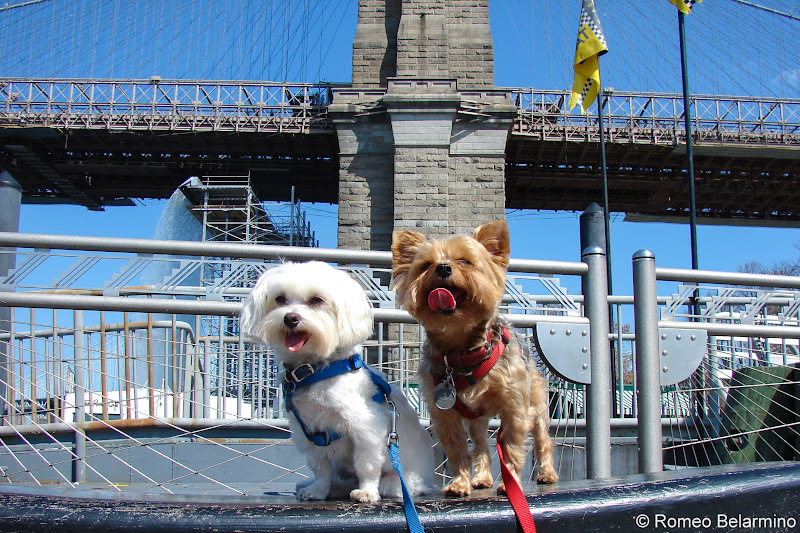 Henry and Charlie in New York City. For some of us, our pets are like our family and we don’t like to be separated from them for too long. When we travel, the only thing that really makes us want to come home is being able to see our two tiny dogs again. 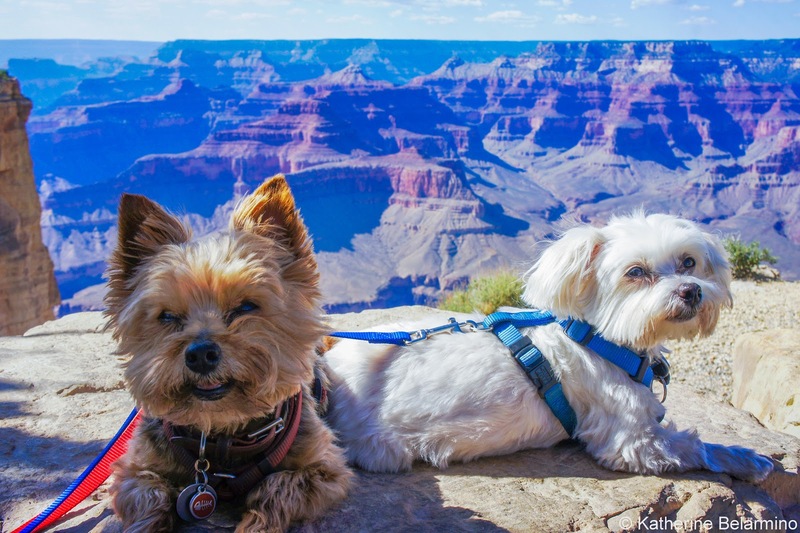 So, while we don’t always travel with our pets, we are always looking for travel opportunities like weekend getaways where we can bring our dogs along. However, traveling with pets is no walk in the park. Here are our 10 tips for traveling with dogs to make your pet-friendly vacations as stress-free and enjoyable as possible. Henry trying out glamping in Buellton. Sometimes hotels advertise themselves as pet-friendly, but the hotel website doesn’t always list all the terms of their pet policy and sometimes those pet-friendly hotels are anything but. One of our pet peeves (pun intended) is when “pet-friendly” hotels won’t allow pets to be left unattended in the room. We don’t like to leave them alone all day, but it’s rare that you can take your pets with you for every single activity, especially meals, like breakfast or dinner at the hotel’s restaurant. Also, exorbitant pet fees like $150 per pet per day indicate to us that the hotel isn’t really interested in having our pets visit. We find it best to call the hotel ahead of time and ask for the terms of their pet policy, including (1) can they be left alone in the room, (2) are they required to be contained in a crate or pen when left alone, (3) what are the pet fees, and (4) are there any dog friendly restaurants and activities nearby. Listen for other restrictions, like pets not being allowed on the furniture or not being allowed in common areas. Get the name of the person you talk to. Once we called the hotel ahead of time and were told pets were allowed to be left unattended, but when we arrived we were handed a policy saying the exact opposite. Since we had called ahead of time and I was able to give the name of the person who had told me the policy, we were allowed to leave them unattended as long as we left a phone number so we could be reached immediately if there were any complaints. We loved that when we checked out, our hotel bill had a note saying it was a pleasure to have our very well-behaved dogs visit. Henry and Charlie at the Grand Canyon. 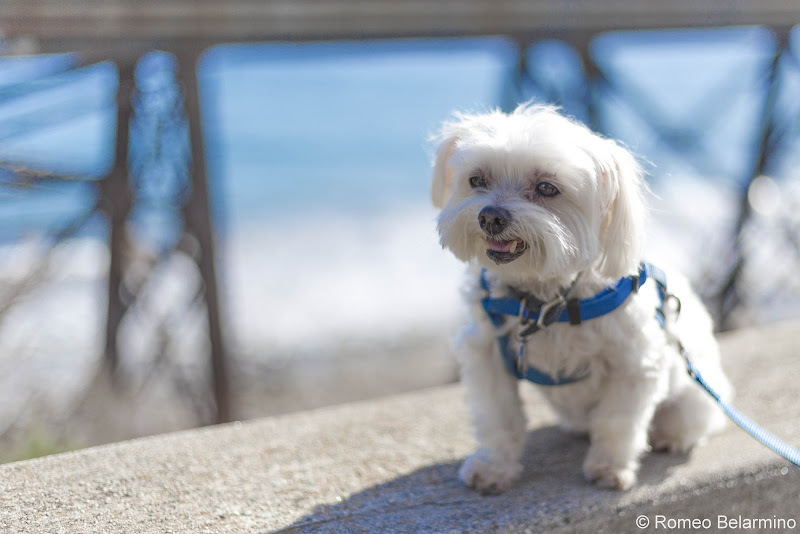 Our favorite dog-friendly hotel chain is Loews Hotels. Loews loves pets (it says so on their dog bowls) and they even have a separate room service menu for dogs, cats, and even birds. We have also had good luck with Radisson, Best Western, and Holiday Inn Express, though the pet policy varies among properties, so be sure to call about the pet policy before booking a room. 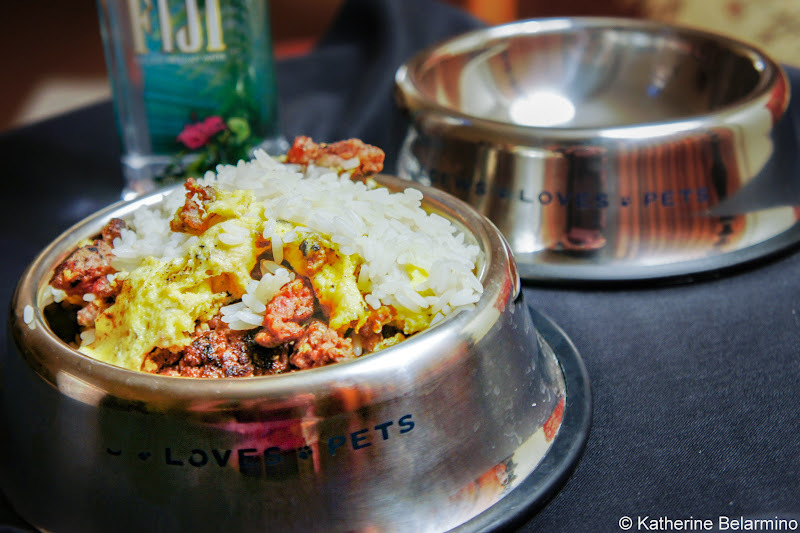 Loews loves pets and has a pet room service menu. If your pet eats as soon as a bowl is put in front of him or her, feeding during a trip may not be a problem. Our dogs self-feed throughout the day when they are home, rather than having scheduled meal times, plus everything is new and distracting, so it can be difficult to get them to eat their food on demand when they have the opportunity. We bring a Tupperware of chicken we cooked at home to mix into their food in small amounts to entice them to eat when we want. Just be sure the extra treats you bring are something your pet is used to, is healthy, and isn’t too rich, as you don’t want them becoming sick. Henry and Charlie in Oregon. Charlie has a very bad habit of sometimes howling for a few minutes when we leave. This can be disconcerting and embarrassing for us, and surely is annoying to other hotel guests if they happen to hear him. We have found that giving him a Greenie, a chewy treat that takes a few minutes for him to eat, keeps him occupied for long enough that he forgets to be upset when he’s done. Henry and Charlie feel safe when confined to their pen. Even if a hotel doesn’t require pets to be crated when left alone in the room, we have found that we have the best results when we confine our two small dogs in a dog pen. They get nervous when staying in a place that is unfamiliar. They are much more relaxed when we enclose them in their familiar pen with potty pads, food and water, and their favorite dog beds and toys. 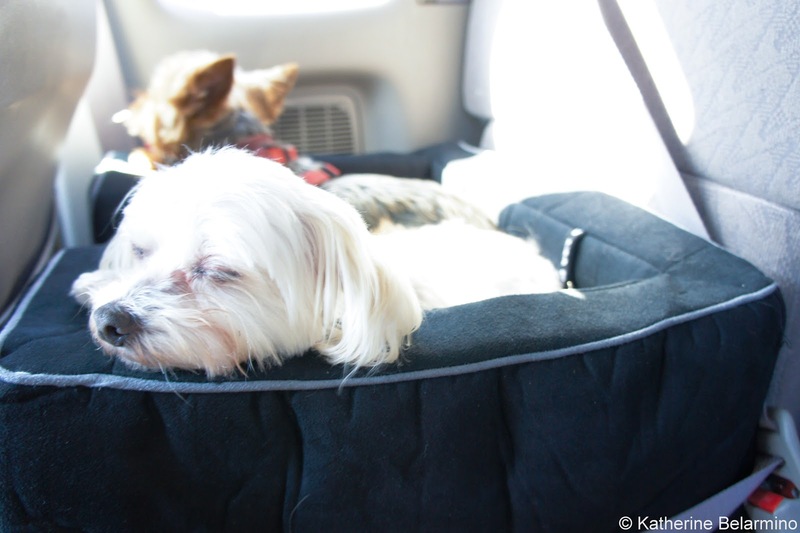 A pet car seat keeps pets safe while driving. 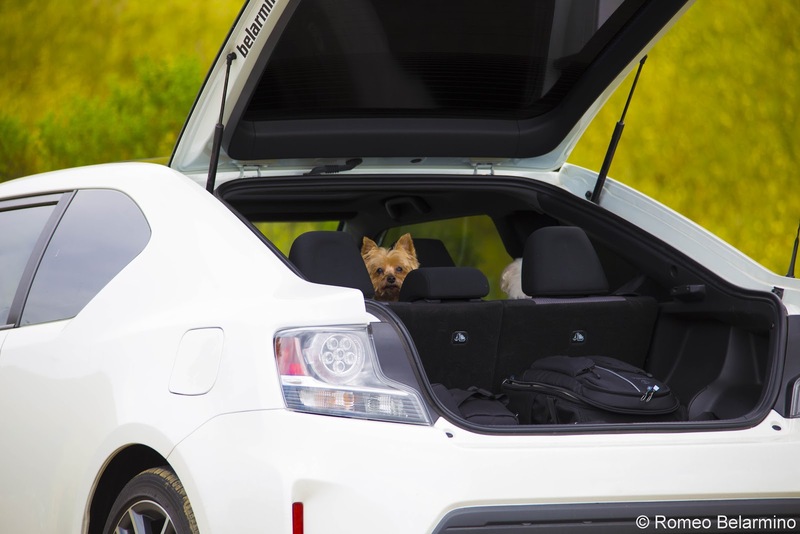 If heading out on a road trip, we suggest using a pet car seat or pet seatbelts to keep your pet safe in the car. While our dogs would prefer to sit in our laps, this isn’t the safest place for them. We use a pet car seat that is stabilized with the seatbelt plus has leads connected to it to attach to their harnesses. For larger dogs, you can use pet seatbelts to keep them in place and safe. Henry and Charlie keep an eye out while we take photos. It is important to use the right equipment when traveling by plane with pets as well. When our friend moved cross country, she brought her cat with her on the plane. The airline’s online pet policy said to use a hard-sided crate, but when she arrived at the airport she learned it actually needed to be soft-sided so it could slide under the seat. We have used soft-sided pet carriers when we have traveled by air with our pets, as they can travel in the cabin with us. 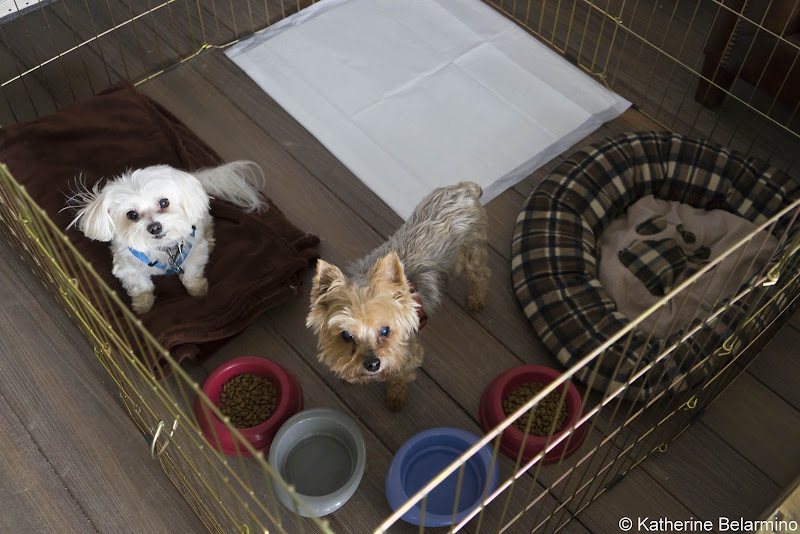 Pets that have to travel in the cargo hold need to be contained in hard-sided crates. It is important to keep dogs hydrated. We carry with us a water bottle and collapsible water bowl so our dogs always have access to water and a squeeze water bottle with a built-in bowl that drains back into the bottle for the car. 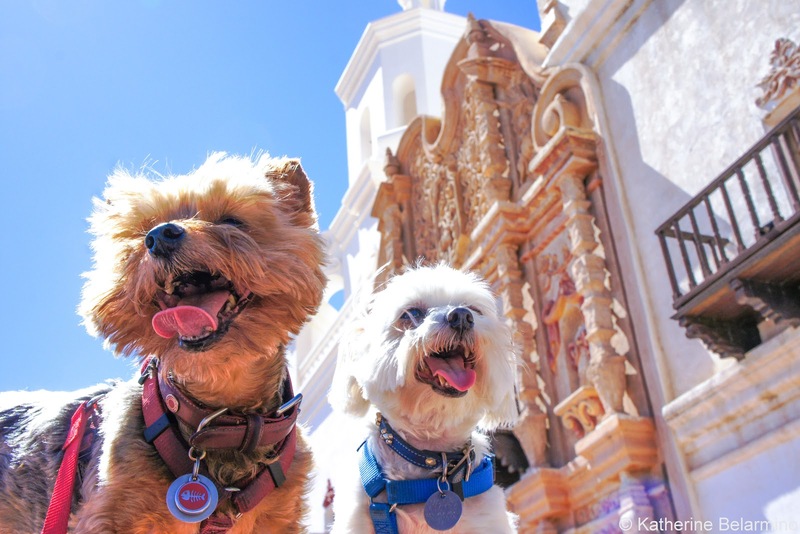 Henry and Charlie at Mission San Xavier del Bac. While we have our dogs take care of business outside whenever possible, we always bring a supply of dog potty pads for the hotel room. This way, if they do decide to take care of business inside, they have a place to do so without damaging the hotel carpet. When we bring our dogs on trips with us, we bring a bag dedicated to their supplies. We bring dog bowls for food and water, water bottle, collapsible water bowl, Ziploc bag of dog food, Ziploc bag of treats, Tupperware of cooked chicken (which we store in the hotel room refrigerator), potty pads, sweaters or jackets in case it gets cold, travel-size dog shampoo and conditioner for when they get filthy, and their favorite blankets and toys which make them feel more at home. Fancy free on the bridge at Arroyo Hondo Vista Point. 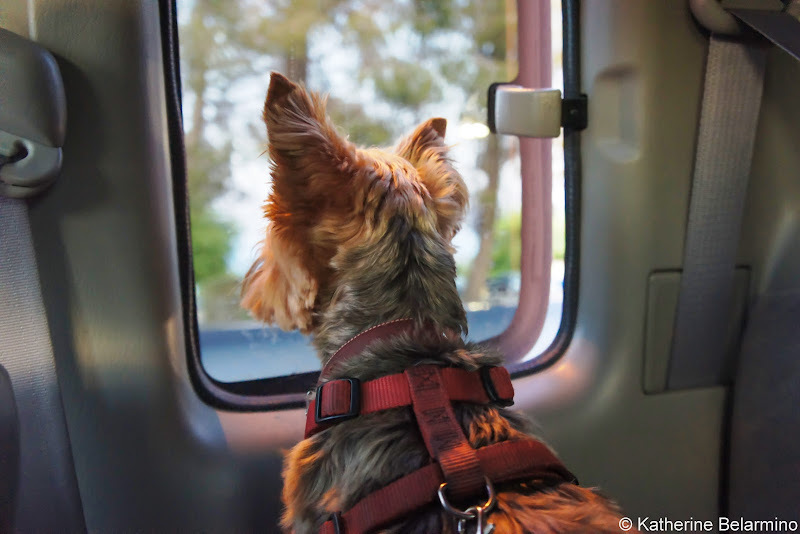 This might seem like an odd tip for pet travel, but it really works. Have you ever noticed that your dog walks the perimeter of your yard? Dogs do this because they want to ensure that the borders of their family pack have not been breached by an intruder. This makes them feel secure and able to relax. We tested this theory with our dogs when staying at hotels. Staying at an unfamiliar hotel in a strange room can be stressful. 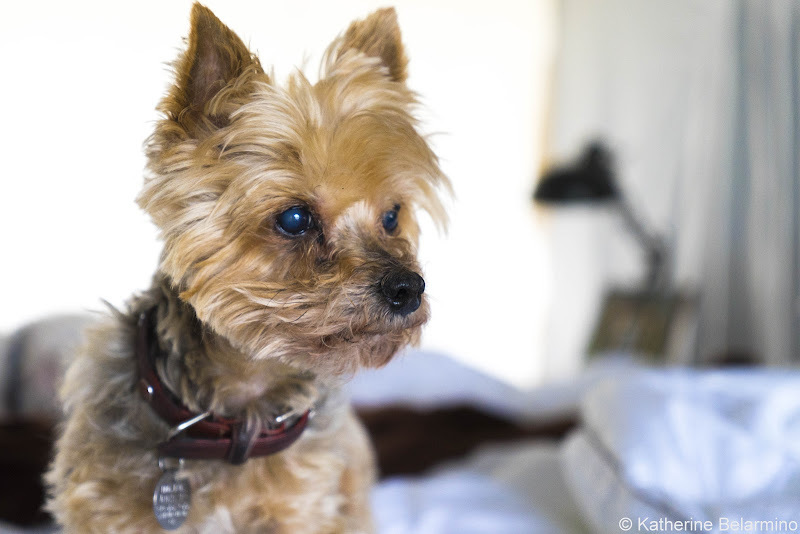 We found this was especially the case with our Yorkie, Henry, who is an alpha dog and is very protecting of his four-member pack. When we arrive at a new hotel, we walk the dogs around the perimeter of the hotel so they can become familiar with their new temporary home. We’ll also take a walk up and down the hallway where our room is located. We have found that our dogs are calmer and get comfortable in the room quicker after we have walked the perimeter. 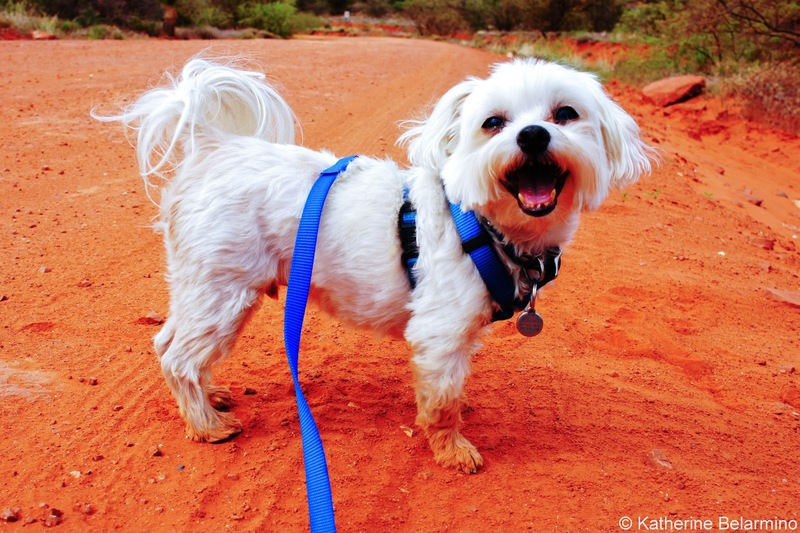 Charlie goes from white to orange in Sedona. No pet wants to travel with their family just to be left in the hotel room alone all day. 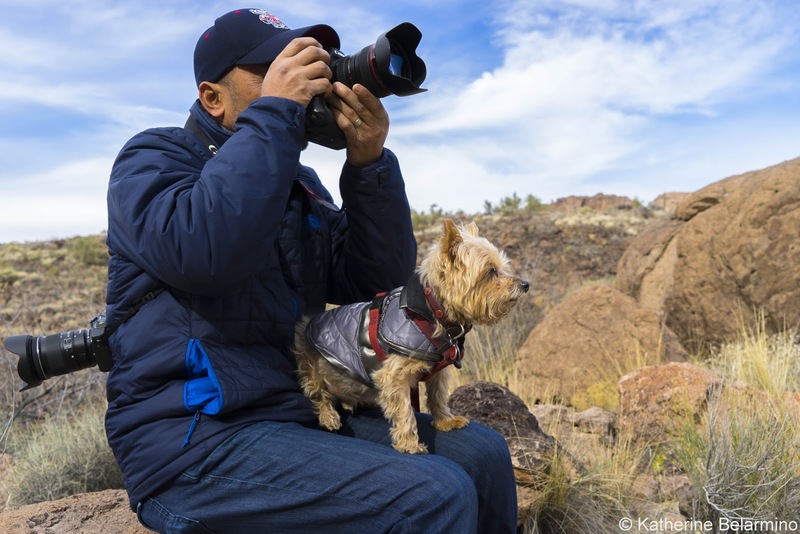 If traveling with dogs, be sure that your travel itinerary includes a number of fun dog-friendly activities so your pet feels included and can have fun traveling too. We like to take them on a walk or hike in the morning, keeping them active, so when we do leave them alone in the afternoon to visit museums or go out to eat, they are tired, ready to nap, and don’t mind that we’re leaving them alone. We also try to find dog-friendly restaurants so we can leave them alone as little as possible. It’s an added bonus when we find museums that allow dogs. 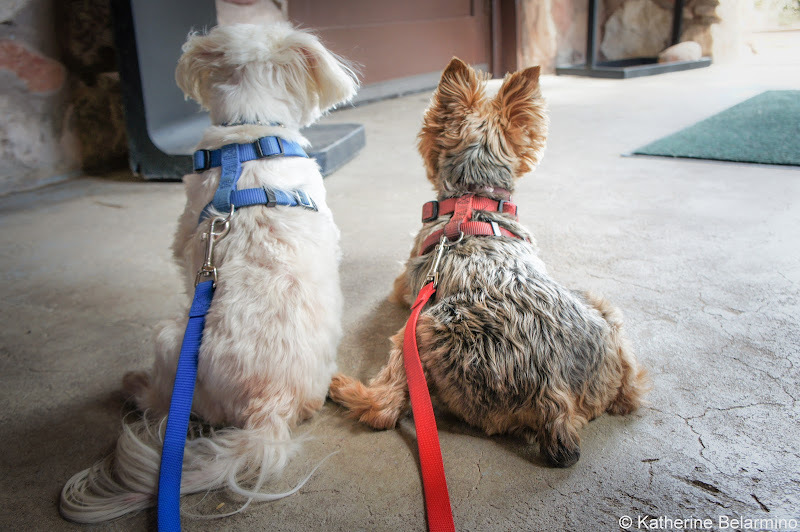 Many wineries are dog-friendly, which is fun for both us and them. Photos mean a break from walking. When traveling with dogs, you may need to travel at a slower pace than usual. When we travel, we like to do a lot and have full itineraries. 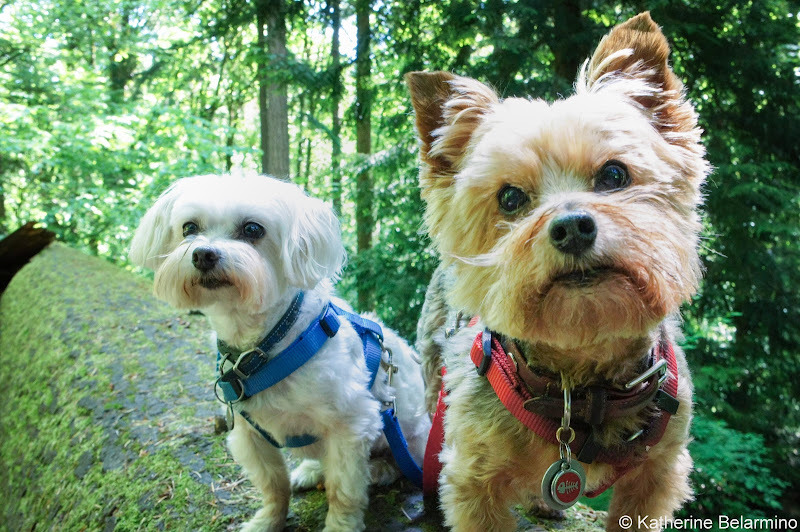 However, this doesn’t work so well when traveling with the dogs, so we slow down, plan fewer activities, and build in fun walking time for the dogs. Also, frantic owners make frantic pets, so doing everything in a calm and collected manner helps keep your pets relaxed so they can enjoy their travels too. Henry's not sure about the snow at Crater Lake. 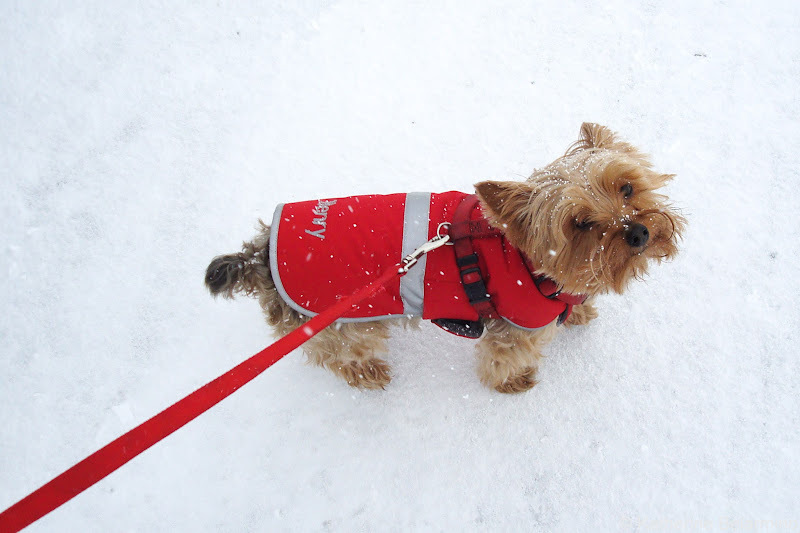 It’s a lot harder to travel in extreme weather situations with pets. It’s important to know what the weather will be like before you go and when making the decision whether or not to bring your pet. If it’s going to be hot, it won’t be safe to leave them alone in the car. It might be hard for them to walk because the hot pavement might burn their feet. You’ll also need to make sure to carry plenty of water so your pet doesn’t get dehydrated. Extreme cold can also be stressful on dogs that aren’t used to that type of weather. You may want to bring sweaters or jackets for dogs that aren’t fans of cold weather. 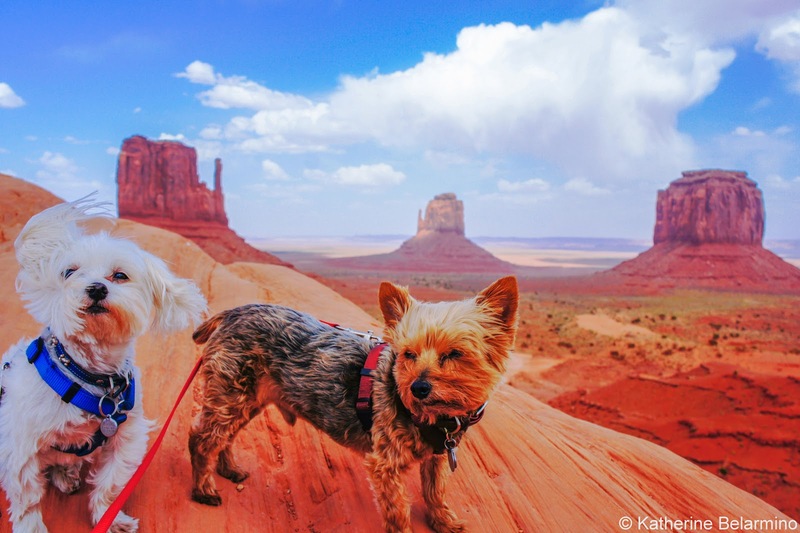 Henry and Charlie brave the wind at Monument Valley. Weather is also extremely important to consider when flying with pets. Airlines won’t allow pets to fly in the cargo hold if the temperature is going to be below or above certain points at any time during the day. Henry's favorite part of a road trip is looking out the window . . . and the french fries. Before traveling with your pet, make sure it is up-to-date with all its vaccinations and certifications. Your pet will be exposed to more opportunities for catching something while traveling than at home and the stress of travel may also make it more susceptible to getting sick. 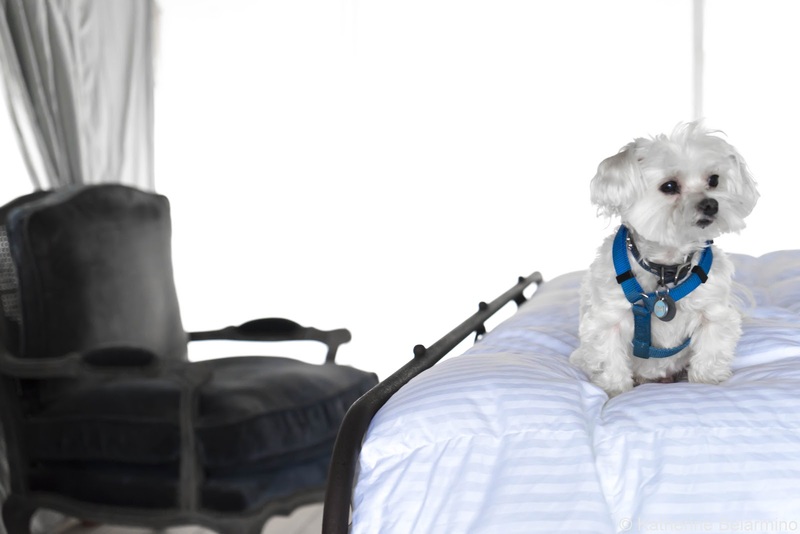 If your pet is already in poor health, it may not be a good candidate for travel. Senior dogs may also have a harder time traveling as a lot of walking might be hard on their joints and they may not be as active as they were in the past. Conversely, older dogs are sometimes easier to travel with because they are more relaxed and don't mind taking advantage of some in-room alone time. 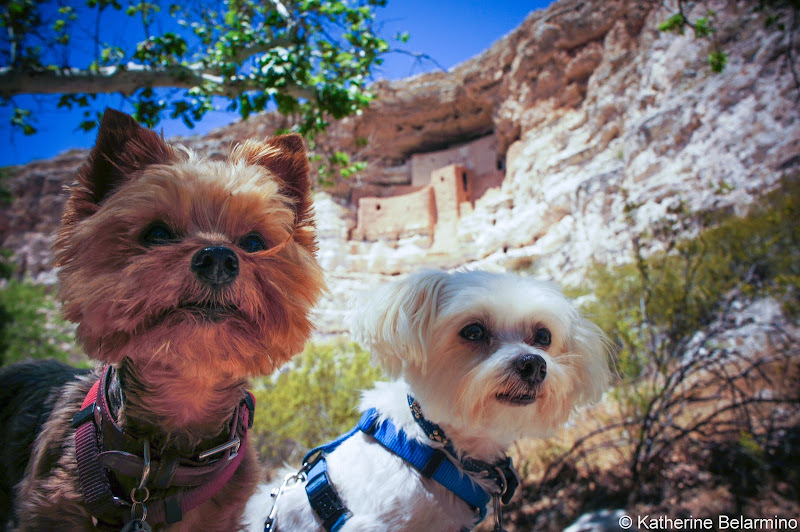 Henry and Charlie at Montezuma Castle National Monument, just before Charlie inhaled a foxtail and we had to find a vet. On a recent road trip, one of our dogs became ill. We were up all night with him and it was an incredibly stressful situation. At 5:00 in the morning I made the decision to take him to a veterinary emergency center I had found prior to leaving for our trip. The last thing you need is the added stress of having to find someplace to take your pet when something goes wrong. Before you leave, do a little research and make a list of veterinarians in every town you will visit, preferably that are near your hotel. Be sure this list includes an emergency vet hospital that is open 24-hours a day. Henry and Charlie won't speak to us if we go without them. We love traveling with our pets, but sometimes it is better to leave them at home. 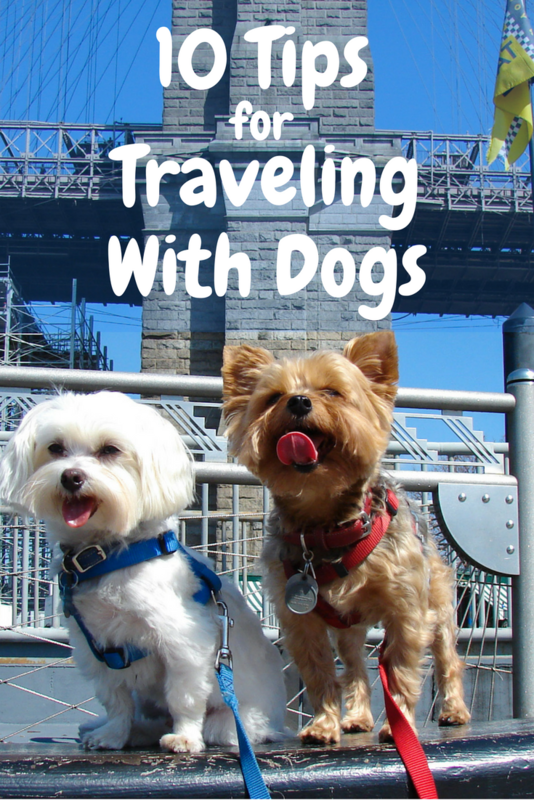 While our dogs love to be with us, traveling can be stressful for them. Staying in an unfamiliar room is stressful. Being left alone in the room or the car is stressful. Not being on their regular day-to-day schedule is stressful. 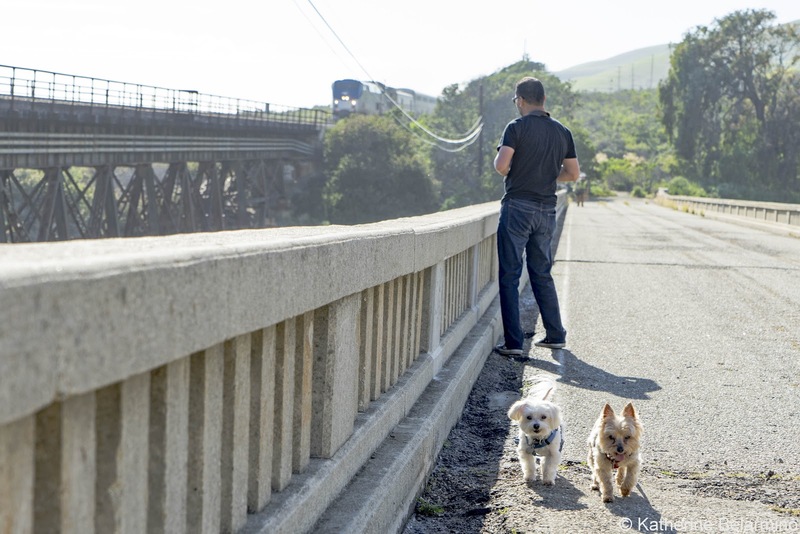 As pets get older, walking long distances becomes more difficult and can be painful. Traveling with dogs can also be stressful on the humans, which can make for a less enjoyable trip. We stress that they are going to bark at an inappropriate moment. We stress that we’ll get a call from the hotel about bad behavior when leaving them alone. We stress they might have an accident. If the trip will be enjoyable for both the humans and pets, by all means, bring them along. But if traveling with dogs will be more stress than fun, leave them at home. This post contains affiliate links. If you purchase through them, it costs you nothing extra but we earn a small commission which helps us bring you more travel stories.